BEIJING, China, August 13, 2015 (ENS) – An explosion and fire at a hazardous materials warehouse in the north China port city of Tianjin Wednesday night, has killed 44 people and sent more than 500 to hospital. At least 21 others are missing. Chinese President Xi Jinping has issued an instruction ordering Tianjin authorities to “spare no effort to treat the injured, search for the missing and contain the fire,” according to the official state news agency Xinhua. The blast occurred at a warehouse packed with hazardous materials, including TNT, owned by the Tianjin Dongjiang Port Rui Hai International Logistics Co. Ltd. Founded in 2011, the facility is a storage and distribution center of containers of dangerous goods at the Tianjin Port. Firefighters arrived at the port at 11:06 pm Wednesday following a report that containers were on fire, said Zhou Tian, head of Tianjin’s public security bureau’s fire department, at a press conference Thursday afternoon. A team of 214 military specialists in handling nuclear and biochemical materials has arrived in Tianjin to assist local authorities. The personnel are all from the Chinese People’s Liberation Army Beijing Military Area Command. Tianjin is China’s fourth largest city. It has two central areas – its main urban area is located along the Hai River, which connects to the Yellow and Yangtze Rivers via the Grand Canal. Its new urban area is Binhai, located east of the old city, on the coast of the Bohai Sea. In the past decade, around 285 Fortune 500 companies have set up bases in Binhai, which is a new growth pole in China and is a hub of advanced industry and financial activity. 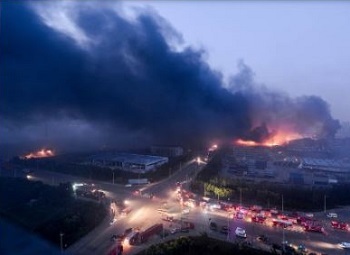 The Tianjin environmental agency told reporters that air quality remains normal in the region near the warehouse, although thick black smoke billowed from the site for hours and it is still smoldering. The city has set up 17 monitoring stations for air and five for water, according to the environmental bureau. In his instruction, President Xi said the cause of the fire must be determined, family members of the victims should be taken good care of and public order should be maintained. Xi urged that search and rescue missions be carried out so as to guarantee the safety of the rescuer workers. Xi urged governments at all levels to draw a lesson from the accident, and carry out safety checks, enhance their management of dangerous chemicals and ensure production safety.